Available Now: "The Men Who Lost America"
Andrew O’Shaughnessy is Vice President of Monticello, the Saunders Director of the Robert H. Smith International Center for Jefferson Studies at the Thomas Jefferson Foundation and Professor of History at the University of Virginia. He is the author of An Empire Divided: The American Revolution and the British Caribbean (Philadelphia: University of Pennsylvania Press, 2000). 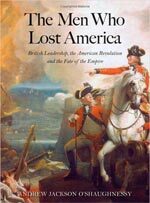 His most recent book The Men Who Lost America: British Leadership, the American Revolution and the Fate of the Empire (New Haven: Yale University Press, 2013) received eight national awards including the New York Historical Society American History Book Prize, the George Washington Book Prize, and the Society of Military History Book Prize. He is a co-editor of Old World, New World. America and Europe in the Age of Jefferson (Charlottesville: University of Virginia Press, 2010) and a co-editor of the Jeffersonian America series published by the University of Virginia Press. A Fellow of the Royal Historical Society, he is a member of the editorial board of the Journal of American History. "The British Surrender at Yorktown"
James Madison Lecture, University of Wisconson-Madison, "'The Illimitable Freedom of the Human Mind': Thomas Jefferson's Ideas of a University"